School Teacher is a mystery to me. I don’t possess nor have I ever come across a copy of the LP from whence it came, The Ballad of Calico. Before spending time researching this track I spent some time scratching my head thinking “how does Kenny make his voice sound so different on this song?” He doesn’t. Enter Kin Vassy. Vassy replaced founding singer/guitarist Mike Settle in 1969 and was subsequently featured on what I believe may be the only single released for this album. 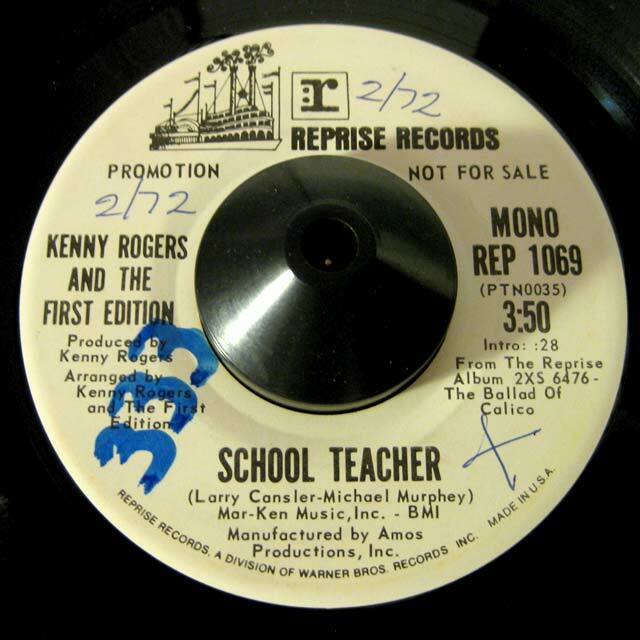 A Kenny Rogers and the First Edition song not sung by Kenny Rogers? WTF??? Well sorry, Kenny, but this track’s burning. While Vassy lacks Kenny’s buttery smooth character he nails down an impressive performance backed by a rhythm track that’s got the unique blend of folky-bluesy-soul that made the Edition famous. The opening arpeggiated Spanish guitar and gentle quality of Vassy’s voice does nothing to hint at the down-right funky chorus that follows with backing vocals that are inconceivably high-pitched and squeezed out as if almost painfully. Conceived as a “country rock opera” by Larry Cansler and cowboy songster Michael Murphey, The Ballad of Calico was both a critical success and commercial failure. It purportedly tells the tale of a late 1800s mining town as recounted by some of its more interesting inhabitants. As a result, each member of the Edition took turns singing lead on the double-LP’s tracks. The album has never been reissued so I guess I’ll be keeping my eyes open for a copy to see if there are any other hidden gems therein.